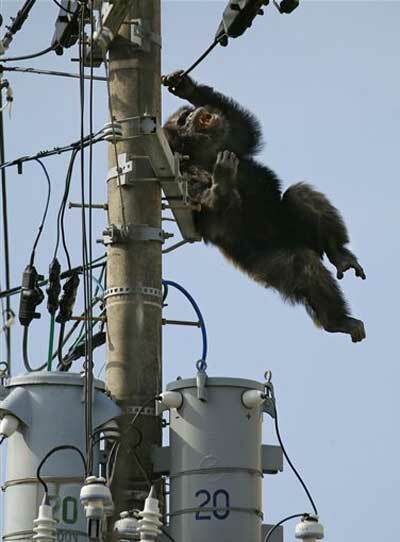 A chimpanzee embarked on a daring escape from Yagiyama zoo in northern Japan, climbing a tall electricity pole before being hit with a sedative arrow and plunging from the wires into a blanket held by a dozen workers. Chacha, a male chimp, survived the fall with minor bruises and cuts, a zoo official said. Japanese viewers were glued to their screens on Thursday afternoon as Chacha evaded capture, swung from power lines and scampered around in a state of agitation. The chimpanzee was on the loose for nearly two hours after it disappeared from the Yagiyama zoological park in Sendai, the city that is hosting finance ministers from the Group of Seven industrialised nations in May. Electricity was lost in 1,848 homes for a brief period during the incident, according to Tohoku Electric Power Co. A witness at the zoo said the chimp had managed to climb over the wall of its enclosure before darting up a telephone pole and making a getaway on power lines. The primate managed to get 250 metres from the zoo before his great escape was brought to an end. TV footage showed Chacha perched atop a pole, agitated and screaming at zoo workers below. 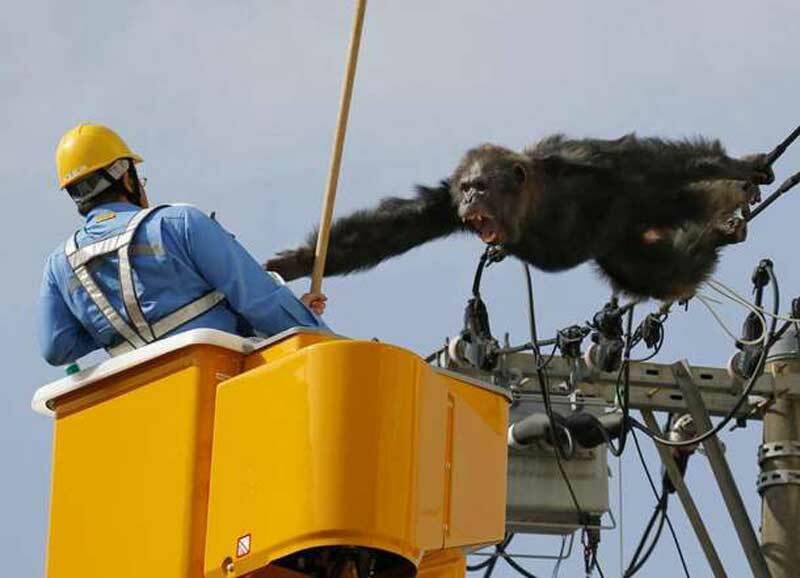 A worker in a cherry picker then shot the chimpanzee in the back with the arrow, sending it scampering along the wires. Chacha pulled out the arrow but, dangling from an electric line, appeared to lose its grip as the sedative took effect, and suddenly fell head down into the blanket. 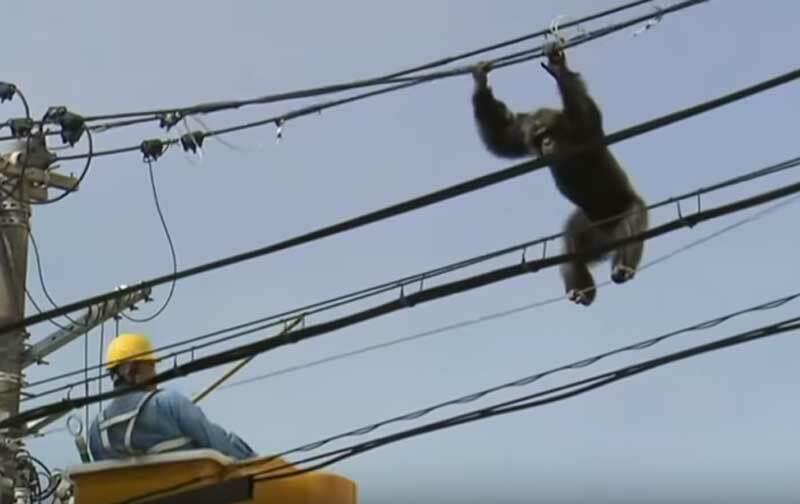 On the way down, Chacha struck another wire before being awkwardly caught by authorities. At 24, or middle age in human terms, the chimpanzee would be slow for a few days as it recovered from the sedative, zoo official Takashi Ito said. Japanese viewers got to witness the entire escape. The zoo was closed on Friday as officials investigated how it escaped. Zoo officials have spotted a hole in the fence, through which the chimpanzee apparently made his breakout.